Medscape: What were the objectives of the GATE Trial? Dr Cohen: The purpose of the GATE trial was to determine whether Synthon's generic glatiramer acetate (G-GA) has equivalent efficacy, safety, and tolerability vs branded GA (B-GA, Copaxone®). Another generic GA (GLATOPA) was approved in the United States earlier in 2015 without a clinical trial. GATE was the first phase 3 trial of a generic disease therapy for MS.
Medscape: What were the results of the trial? Dr Cohen: The recently published 9-month core study demonstrated equivalent efficacy measured by gadolinium-enhancing MRI lesions during months 7, 8, and 9. Also, G-GA and B-GA showed comparably good safety and tolerability, including when it comes to injection-site reactions. There was no demonstrated benefit on clinical relapses in the patients treated with G-GA or B-GA compared with placebo. However, the study was short, and more importantly, it had a small placebo group (n=84), so there was little statistical power for this endpoint. Following participation in the 9-month core trial, patients were offered participation in a 15-month extension study in which patients treated with generic GA continued therapy, and those treated with branded GA or placebo switched to generic GA. Efficacy, safety, and tolerability were the same in patients continuing G-GA and those who switched directly from B-GA to generic. These additional findings support the interchangeability of the two GAs. 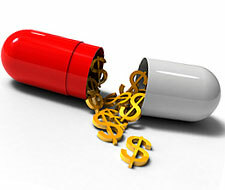 Medscape: What are the clinical implications of your findings, particularly in terms of cost? Dr Cohen: The costs of MS medications are extremely high and are increasing. It is hoped that the availability of generic alternatives will provide savings in cost. Medscape: What is the status of generic Copaxone with the US Food and Drug Administration (FDA)? Dr Cohen: Data concerning Synthon's G-GA, including by chemical, biochemical, biological, and animal studies and data from the GATE study, have been submitted to the FDA, European Medicines Agency, and other regulatory agencies. We are awaiting a decision. Medscape: Do you have any final thoughts? Dr Cohen: The equivalence of this G-GA to B-GA is supported not only by extensive chemical, biochemical, biological, and animal studies but also by a clinical trial in patients with MS, which demonstrated equivalent efficacy, safety, and tolerability. Clinical trial data are not available for other generic GAs.